"Safari Time Pays The Bills"
While OK Delta Air makes good money moving tourists and supplies throughout the Okavango, the cream rises when we are tasked to an aerial safari. This is where the tourists wish to view wildlife and natural terrain features from the air instead of on the ground. This type of flying comes with its own set of challenges however. First of all, you want a really nice day in the Delta without any turbulence, minimal clouds and no rain. Good viewing comes with the sun overhead as well, so flights around the noon hours work well. It is not always easy to spot wildlife on the ground, despite the rather flat and featureless terrain for the most part, so this neccesitates low and slow flight. No less than 1,000 feet above the ground though - nobody wants to put pressure on the animals nor do we wish to push our luck. A blown engine at a thousand feet gives us, at best, a minute before we're touching the ground, and that's not a lot of time to figure out a relatively safe spot to set it down. The pilots of the various charter companies do tend to keep each other informed of where there are concentrations of animals so that they can all satisfy whatever tour flights they have booked. This is helpful as it allows you to fly to an area for viewing rather than wandering aimlessly around hoping for the best. Today is your day, and also a great day for flying an aircraft in the OKD fleet that you haven't yet. Yes, the owners and CP have cleared you to fly one of their Cessna 208B Grand Caravans. Your log book and CV that you supplied to the admin team at OKD suggests that you are well versed in the Caravan, and they have several available for a load of tourists wishing to do exactly what your group wants to do. You'll have the morning to re-familiarize yourself with the craft as well as see that it gets topped up with Jet A1 fuel, being as it is a turbine. You have seven tourists going up with you and they specifically want to view, and photograph, rhinos and elephants. Being as they will be returning to Maun, they have no other gear with them other than camera equipment, their standard 'tourist safari' clothing and assorted paraphernalia. They have been advised to bring good sunglasses and protective clothing should they end up on the ground at any point with no shelter for a period of time. Standard safety precautions of course. 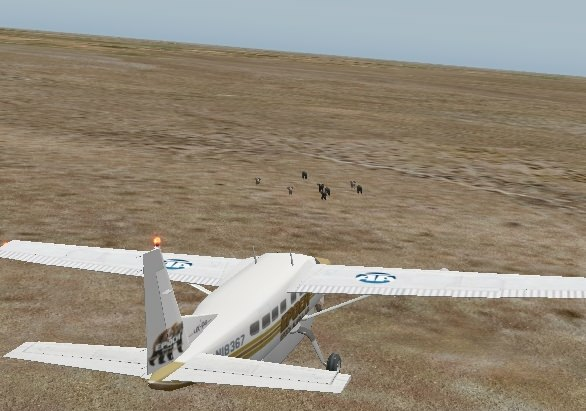 You shall depart FBMN Maun in the Cessna 208B Grand Caravan with 7 passengers . - Fly to the flood lake a few miles southeast of FB88 Vumbura. Fly over Vumbura first for reference. - Locate and do some low passes over the rhinosaurus' along the shoreline. - CAUTION: Watch for other scenic flight aircraft in the area! - Depart the area and continue NNE to FB08 Chobe. - Examine scrub brush within a few miles of Chobe, looking for a small elephant herd. - Do some low passes over the elephants for photos, remembering not to spook them. - Return to FB08 Chobe and land for a quick lunch for the guests. - After luncheon, return to FBMN Maun and deplane the guests and secure the craft. Depart FBMN. Flyover FB88. Flyover FB08. Land FB08. Depart FB08. Land FBMN. Now that the tourists are tucked back in Maun, Company has asked you to take a quick revenue flight. You need to fly east to FB51 Motopi in the Cessna 206/207 and pick up 4 locals who wish to travel to Maun for work. Real METAR No Pax/No Cargo Today's Date Time = 30 minutes after return from #1 Flight. Real METAR 4 Pax (680#) / Cargo (200#) Today's Date Time = 15 minutes after landing Motopi. This has been more of a typical flight day for the Delta and it is hoped that you enjoyed it, not to mention the opportunity to fly in near-bone-clear skies! Tomorrow will be your last standard Vacation Day and it comes with quite the surprises! Airborne with seven gawkers from FBMN Maun, we are headed for the Rhino spotting grounds near Vumbura, except the ol' PIC (that'd be me) forgot to set the GPS properly. Don't worry, the tourists obtained much better photos than I did with my phone. A bit heavier for the hearty Lunch, we prepare to leave Chobe. A couple of Guides are killing time uncomfortably close to the active runway. Oh well, it's their lungs that'll soon be breathing my Caravan's dust. The trip back to Maun was uneventful, although the wind did increase a bit to bless/curse us with crosswind landing. Overall, the weather was very cooperative for today's missions. Hoping CptTroll gets his elephant pics up, or gofigure, from the Chobe National Park. But those two standing by the airstrip certainly make it all worth while for the tourists (who paid $2,200 US each for the excursion). Makes you wonder why we're all living in tents in Maun eh? Great flying with you gents last evening. Will have to complete my Motopi leg later this week - I'll keep an eye on the weather for sure! Alrighty. Finally made the trip in the old tigerstripe 207. But, may have left it too long. Here I am departing Motopi and no sense with screenie from Maun - it gets dark r-e-a-l fast out here in Botswana!!! Fun flight and that's a good load for this aircraft for sure. Left for Ohio Venison hunting on Sunday, back now and getting time to post animal pics. Rhinos at a lake 10-12 nm Southeast of Vumbura. Elephant hurd grazing near Chobe.